In the first two months of rock ‘n’ roll we’ve had just one lone female, the great Albennie Jones, to break up the monotony of the male dominated field thus far. I suppose this disparity is all too appropriate considering that in 1947 women were expected to stay home and bake cakes or something, not make rock ‘n’ roll records. I mean, if we give our tacit approval for these kind of wild shenanigans the next thing you know they’ll want careers and equal rights and then… good god who will bake our CAKES?!?! Yet here we are in November 1947 and this is our second female-led record in a row. How’s that for progress? Sadly it’ll be a little while before this becomes a more common occurance. 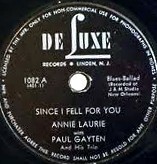 Annie Laurie had helped put DeLuxe Records on the map in the summer of 1947 with a huge hit in Since I Fell For You, a ballad first done by Buddy and Ella Johnson, though probably best known today for Lenny Welch’s exquisite 1963 version whose presence has graced many a TV show, movie soundtrack and commercial in the years since. 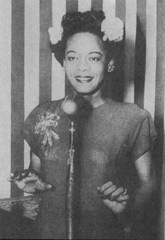 Laurie’s runaway success with it, along with that of her longtime collaborator and benefactor Paul Gayten who scored with his own Top Five hit at the same time, led to DeLuxe virtually cornering the market on New Orleans artists which as we all know would soon lead to rock ‘n’ roll itself emerging from the Crescent City when just a few weeks later they signed Roy Brown. Following Brown’s breakthrough, and the subsequent signings by the label of other locals we’ve already met in Smiley Lewis and Dave Bartholomew, New Orleans seemed poised to lead this new style into national prominence. Nobody quite knew what to make of it exactly but clearly something was brewing in the bayou and so the question was would Annie Laurie herself soon join in the fun? Laurie was a talented singer in her early twenties who was versatile enough to jump from pop to jazz to rock and back again in the blink of an eye over the course of her career, though not always to her lasting commercial benefit as an artist. Though she’d be a regular – and welcome – presence on the scene for over a decade and almost always could be counted on to deliver something of worth, she never became a superstar and in many ways never quite matched (at least based on the public’s reception) what she’d delivered just before rock emerged. The odd thing about Since I Fell For You, the record which had put Annie Laurie on the map, is that it’s not particularly well done, at least for the level of interest it stirred. Oh it certainly isn’t bad or anything, far from it, in fact it’s relatively effective all things considered, but it’s hard to understand how it was SO popular, not only with black audiences whose tastes it was more tailored for, but shockingly for the time how it connected with white listeners as well, crossing into the Pop Top Twenty, when it all sounds so… unfinished. 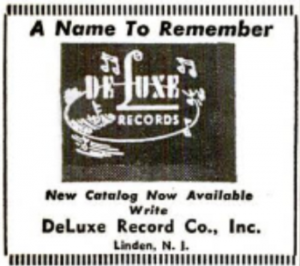 Let’s just say when scouring the “race” records of the first half of 1947 it certainly would not be the one you’d pick out for having that elusive crossover appeal. To start with the arrangement for it was skeletal with only Gayten’s choppy piano audible behind her, making it sound far more like a demo than a finished recording. While his solo was reasonably proficient the rest was rather crude, almost like he was merely sketching out what he’d later embellish for the master take… except this WAS the master take. Meanwhile Laurie’s delivery, while endearing in a way as she tries her best to impart the song with the requisite emotion, is nevertheless extremely rough around the edges. She’s got some measure of soulfulness at times but her phrasing, pacing and control are all still noticeably lacking as if she’s unsure of just what to emphasize at various points in order to highlight the lyrics and the message they impart. She sounds more like a talented amateur who’s yet to acquire the polish she’ll need to make a go of it professionally. But of course it wound up doing far better than any one would’ve dared hoped, especially for an unknown singer on a small independent label, and so when it came to following that up it would be interesting to hear how – or if – she evolved from there. As we’ll discover all too often over the ensuing years early success can be as much a detriment as a boon to an artist’s career because it often stunts their growth artistically if – thanks to the reception it received – they feel no need to improve on their technique. Thankfully in the intervening time Laurie has clearly been woodshedding because here she starts to sound more like a finished product. Her voice is fuller and more self-assured, she’s no longer reaching in the dark simply hoping to hit upon the right mood, she’s now got a firm handle on the necessary emotional perspective from the start. This time around the production and backing – by Gayten once again – is also much more filled out. The difference in how it all sounds at first glance is striking. But that doesn’t mean I Still Love You is a great record by any means. It has its own flaws which are easily spotted and while they’ve eliminated the particular shortcomings which plagued Since I Fell For You, the song they’re working with this time around isn’t quite as strong a composition despite it also being penned by Buddy Johnson. This clearly was intentional on their part, hoping to hit on the same attributes that made their first foray so successful, but whereas that song was a rich novel with lots of undercurrents this is a mere cliff-notes version of the same basic sentiments without the lyrical or melodic sparkle that makes “Since I Fell For You” so enduring even now, almost seventy-five years after it was written. Because they were looking to hedge their bets considerably by choosing this material, so much so that it could rightly be termed a sequel, which is something that usually indicates a total lack of confidence in trying something new, we then have to look to see if they recycle many of the same instrumental attributes to go along with the similar lyrical content and overall mood. They do. Of course they do! Gayten’s piano opening here is equally harsh and unmelodic, much like the last time out, but then it settles into a more refined approach which at least begins to set it apart somewhat. But while it sounds better on one hand it’s almost too dainty on the other. He’s playing lots of right hand trills that are little more than aural fluff, a step away from parody at times and which seems to be an even more overt stab at attracting a crossover audience. When you show such blatant desire for “respectability” (and I’m using that term as derisively as possible) it doesn’t say much about how you view your own core audience. But they’ve also added some other instruments to fill out the sound making it more of a polished production much to its overall benefit, giving it a much fuller sound as a result. There’s a more audible acoustic bass that holds down the bottom throughout while an electric guitar jumps in to take a solo, though that is far too supper club jazz oriented in its approach. While you appreciate the different sonic textures offered up here you just wish they delivered them in a more earthy fashion. It’s as if for every addition they’ve made to improve it they’ve taken a step backwards in how it’s all presented, hardly resulting in a net gain in the process. Where it DOES pick up though is Laurie herself. Gone is her tentativeness when it comes to how to tackle the vocals and the accompanying uncertainty regarding the emotional content behind it. Her voice rises and falls throughout this with measured grace, holding notes with a clear sense of purpose, dropping suddenly at one point to change the mood, commanding your attention throughout with her choices. It isn’t a bravura performance by any means but it is a confident one that imparts the right amount of grit and soul while thankfully sidestepping whatever pop flourishes you might expect her to try and add in order to further appeal to the swankier crowd following her breakthrough in that regard. If Since I Fell For You had been something of a fluke in terms of the size and scope of its impact, an early harbinger of her raw talent before she’d acquired enough of an understanding of the finer aspects of her delivery to be fully cognizant of what she was doing, I Still Love You is more of a validation of that initial promise, showing she was a quick study and a hard worker who wasn’t destined to be a quickly forgotten one-hit wonder. There’s some definite ambition here on everybody’s part, not just to try and capture similar success, but more crucially to improve their work, shore up their deficiencies and really start to establish a sense of artistry. Now that said most of the components here are still in need of some tweaking, particularly on Gayten’s part – though he was far too skilled a musician, bandleader and producer not to figure out its shortcomings – so as a result I Still Love You doesn’t quite rise above Since I Fell For You, but its strengths are different, as are its weaknesses, and so depending on what aspects the listener tends to focus on there will be those who may find it a bit better than that earlier side while others think it drops a little behind it. For me it all averages out, both are good enough for me to want to hear more without thinking either one too special on their own. But on the basis of what’s she’s delivered thus far and the strides she’s personally made during that time, from this point forward it’d be entirely reasonable to expect to hear even better from Annie Laurie in short order which would go a long way towards evening up the gender inequality rock had started out with. Leave a reply on "Annie Laurie: “I Still Love You”"